You might be thinking to yourself, “why do I need to get a coffee maker when I can fix myself a cup of instant coffee?” Well, if you are a coffee drinker, you know that there is a big difference in taste. Drip coffee makers are now becoming a staple in the household, as it is one of the most common ways of brewing coffee today. Drip coffee makers are preferred by many because they’re easy to use, consistent, and convenient. Aside from these things, there are other benefits to love about drip coffee makers. Automatic features, which makes brewing coffee very simple. Most drip coffee makers can be programmed to brew coffee in advance by setting the timer and have the coffee waiting whenever you are ready to have it. Brewed coffee can stay warm even for hours. Ability to brew coffee that is lighter in flavor. This is because the machine filters out the oil and keeps the coffee taste lighter. 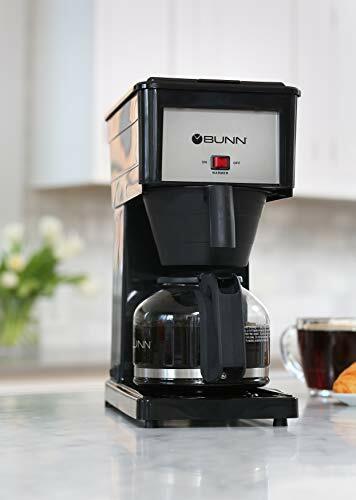 Now that you are convinced that you need a drip coffee maker in your life, the next thing that you should know are the important features to look for. By being informed, you can determine and differentiate the drip coffee maker from other types of coffee machines. Knowing the features will also help you choose the right one for your home. The timer is one of the main selling points of a drip coffee maker. As mentioned earlier, one of the benefits is that it allows you to brew coffee in advance even when you are busy doing other chores. The self-timer of a drip coffee maker will help you get your coffee fix within the determined time. You will be notified through an indicator light or an alarm when your coffee is ready. The heat also automatically adjusts to prepare the coffee within the designated time. This feature works simultaneously with the timer and will automatically turn the drip coffee maker off when the coffee is ready. You can save a lot of time and effort with this feature because you can focus on other tasks that you need to do while preparing the coffee. Many consumers love this feature on coffee machines because it allows you to momentarily stop the brewing process so you can get yourself a cup of freshly brewed coffee. The brewing will continue when you place back the carafe on the machine. This is useful if you do not have the time to wait for the full brewing cycle to complete and you need your coffee fix. How much coffee do you need at a time? Consider the capacity that the drip coffee maker can handle and serve to save time and energy. Take note that most coffee makers consider 5 ounces as a cup and most drip coffee makers offer either 4, 10, 12, or 14 cup carafes. You must check the size of the filter basket as you need something that will meet your coffee needs. If you are the only coffee drinker, then a small or regular size is okay, but if you prepare coffee for many people, then the filter basket should be larger. 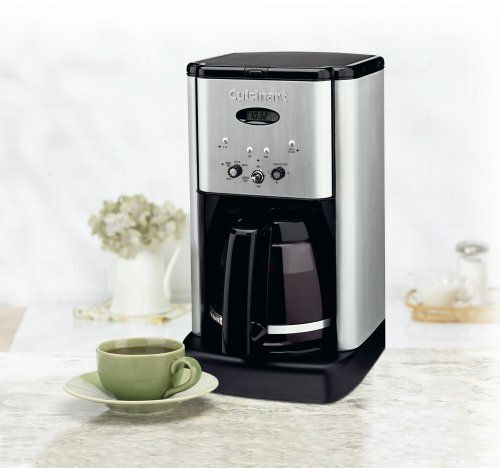 You can also choose paper filters or opt for coffee makers that already have permanent filters. It is important that you choose well because this feature will have an impact on how easy it will be for you to clean and operate. Some drip coffee machines include a water filter which can help eliminate chlorine and bad odors, sometimes even tastes from tap water. Water plays a big part in your coffee and nothing, aside from the coffee beans, cream, and sugar should affect the taste. Keep in mind, though, that a water filter also comes with the added effort and expense of replacing the filters so you may or may not want one on your machine. Always check the warranty before purchasing as you are investing. Most high-end brands come with around 3 to 5 years of warranty, and that says much about the quality of the product. On the other hand, budget-friendly drip coffee makers tend to have only one year of warranty. Depending on your personal preference, you may also consider other things and look for other features when buying a drip coffee maker. Of course, it would also help if you can have a budget that you can set aside just for the machine. The important thing is that you should buy a high-quality product that can cater to your needs, without you having to spend too much on the machine itself. Here are ten drip coffee makers that we recommend. 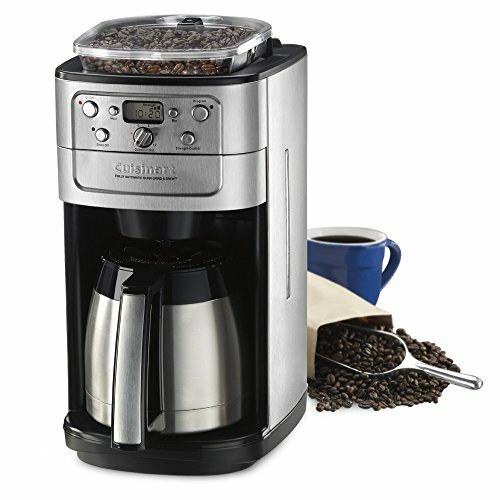 This drip coffee maker from Cuisinart is stainless steel and programmable with different functions. You can brew regular or bold coffee and program it up to 24 hours in advance. It has a 1–4 cup setting and has the automatic shut-off feature. This Velocity Brew coffee maker has a multi-stream spray head to shower hot water evenly over the coffee grounds. It brews 4 to 10 cups for up to 50 ounces of coffee, and the hot water tank is stainless steel. The 10-cup capacity can brew in about 3 minutes. 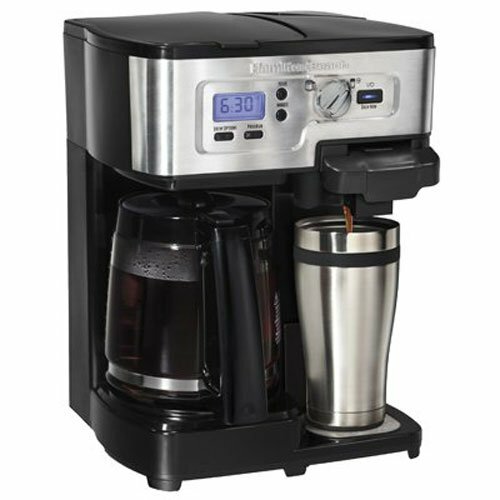 This drip coffee maker comes with a classic brushed metal and black design, a 24-hour advance brew start, the automatic shut-off feature, and a 1–4 cup button. It has a charcoal water filter and a gold tone filter and comes with a measuring scoop. 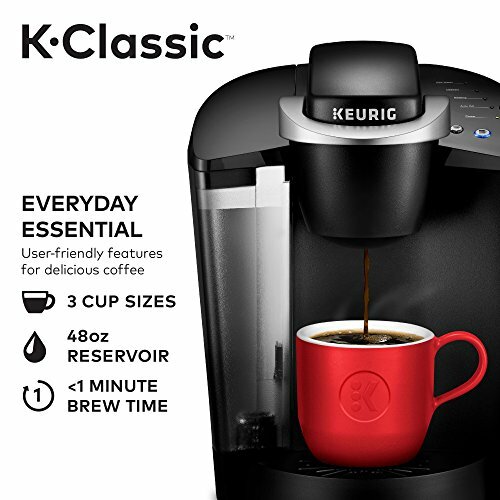 Using single serve K-cups for this Keurig drip coffee maker speeds up the process and makes just one cup at a time. This model comes in black, white, navy blue, or burgundy colors. You can brew 6-oz., 8-oz., or 10-oz. sizes. The water reservoir holds 48 ounces. 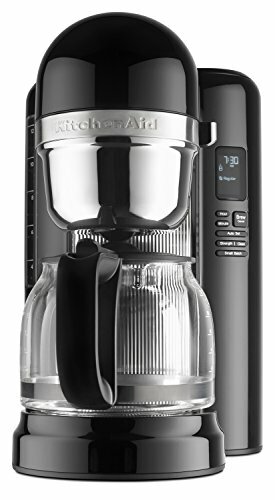 This large and impressive coffee maker from KitchenAid is white or black and has a 24-hour programmability feature. You can choose regular or bold brewing, as well as a small batch brew (2-4 cups) mode. There’s a “pause and pour” feature to stop the brewing so you can pour a cup of coffee. 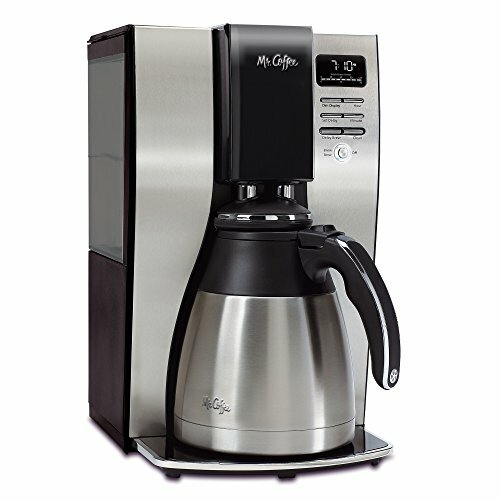 This 10-cup coffee maker from Mr. Coffee has a thermal system, which means the coffee pot is more like a carafe to keep the brewed coffee warmer longer. It has a delay brew timer to set the brew time ahead, a freshness timer, a cleaning cycle, and water filtration to remove 97 percent of chlorine. 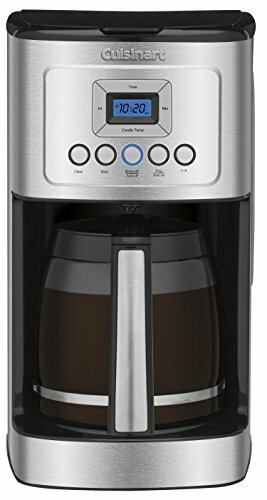 This impressive 12-cup coffee maker has a large carafe, a digital LCD to program 24 hours ahead, a 2-hour automatic shut-off feature, and the ability to pause it while it’s dripping. It’s made of stainless steel with a polished finish. The OXO Barista Brain has a microprocessor-controlled brew cycle that acts similarly to a French press. It produces 2–9 cups of coffee. Water is heated and held at a temperature between 197.6° and 204.8°. There’s a 24-hour programmable start timer and LED screen to display the freshness. It’s quite large at 14.17” x 6.73” x 15.24” in size. 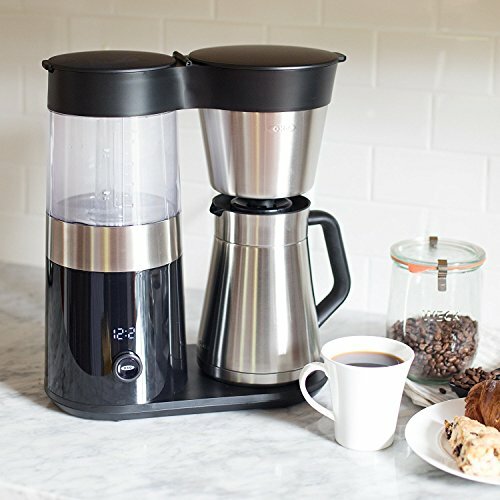 This Hamilton Beach coffee maker combines a carafe and Keurig-style single brew in one machine. There are two separate water reservoirs with bold or brew regular strength options. On the single brew side, you can brew into a mug or 8” travel mug. It can be used with ground coffee or a K-cup. It’s 10.63” x 10.24” x 13.9” tall. Another thermal carafe coffee maker, this Mr. Coffee machine brews 10 cups. It’s made of stainless steel, has water filtration, a side-style coffee filter, delay brew, and a cleaning cycle to eliminate calcium. The coffee stays hot because the carafe is well insulated. It’s 10.8” x 12.3” x 16.3” tall.